WTT? is always on the lookout for a good bargain (aren’t we all? 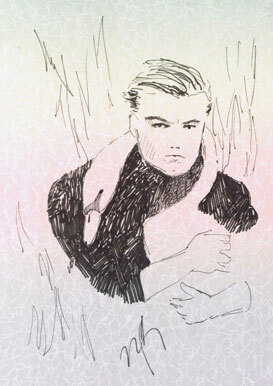 ), and this fire sale is the cheapest/ best deal since Kate Ruggeri’s public drawing trade. After Scrap Heap’s drying rack debut was unfortunately dampened by rain last summer at Medium Cool, Sofia Leiby is back with an even bigger roster of artists willing to sell their tra$h for ca$h. 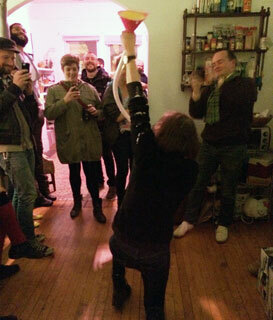 Putting her scraps where her mouth is, Leiby will be hocking studio ephemera for $20 or less. 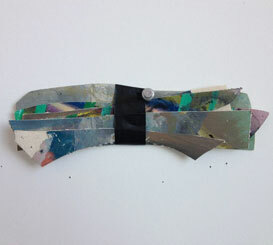 Delightfully affordable work by Leslie Baum for Scrap Heap II. 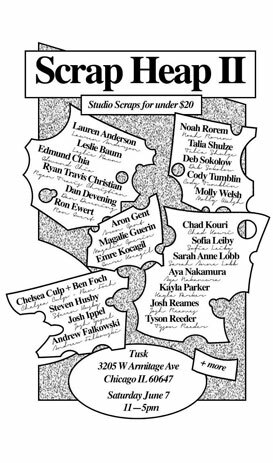 Featuring artists such as Ryan Travis Christian, Ron Ewert, Magalie Guerin, Ben Foch, Josh Ippel, Leslie Baum, Aron Gent, Emre Kocagil, Tyson Reeder and Aya Nakamura, the fragments and sketches will be available for a limited time only from 11-5PM, June 7th at TUSK. 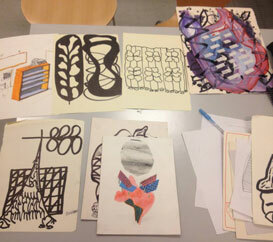 Matisse much? Aya Nakamura’s painted scraps. Already jealous of whoever picks up this glorious scrap by Edmund Chia. More information and preview photos can be found on Leiby’s Facebook. 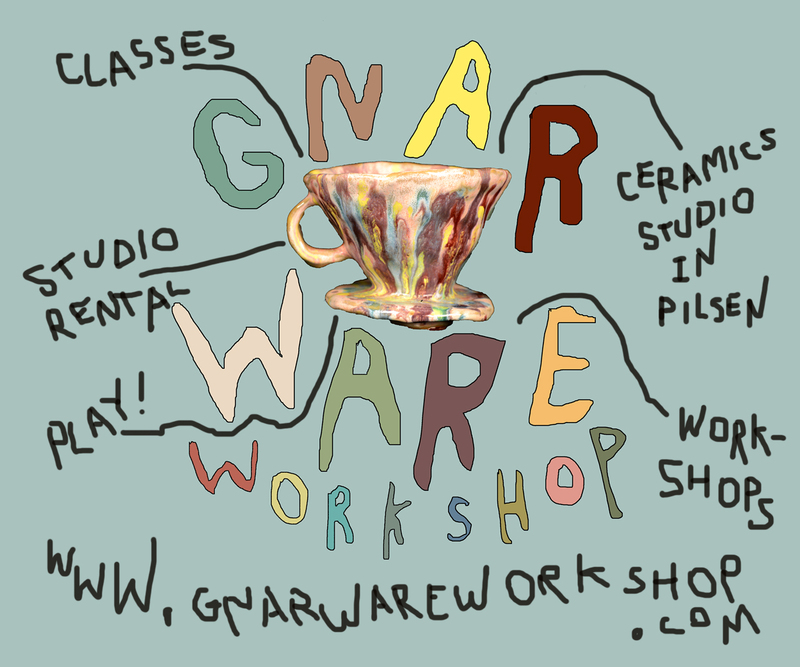 All proceeds will go to participating artists. 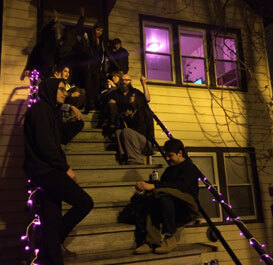 Tusk is located at 3205 W Armitage in Logan Square. 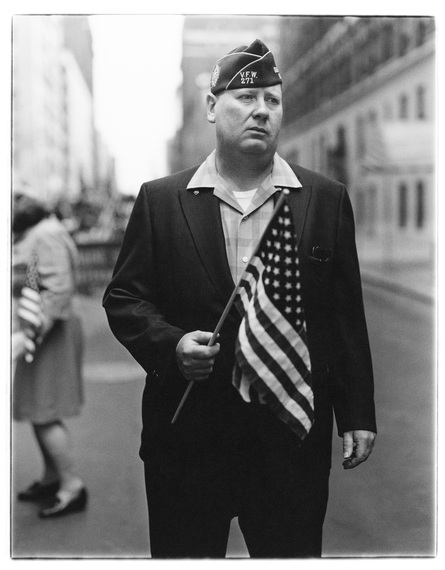 Diane Arbus, Veteran with a flag, N.Y.C. (1971). © The Estate of Diane Arbus. 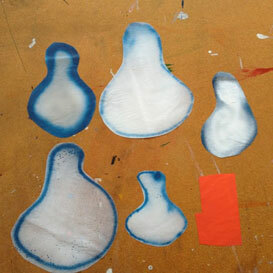 Header image features work by Leslie Baum from Chromatic Consortium at The Franklin. 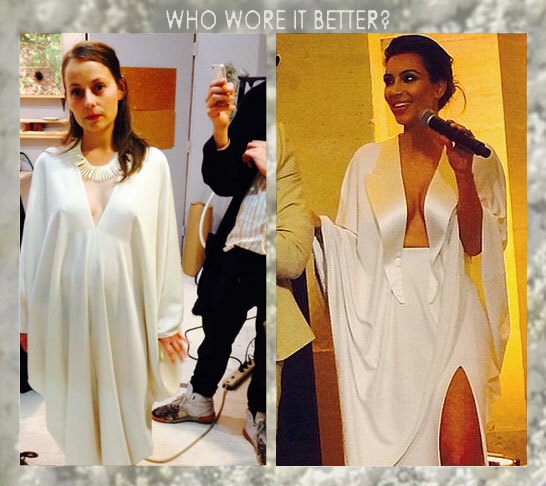 Shannon Straton dressed in Renovar for the Threewall’s Skywalker Benefit on June 7th VS Kimye’s post wedding gown. 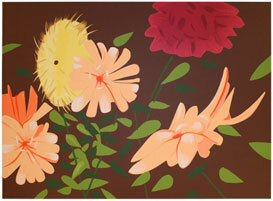 Alex Katz, Late Summer Flowers, 2013, 38 color silkscreen on 4-ply, 40 × 55 in, Edition of 50. Vertu Fine Art. BREAKING: Fitzpatrick to Go Out with a Bang. And a Stage Show. And a Magazine Portfolio. 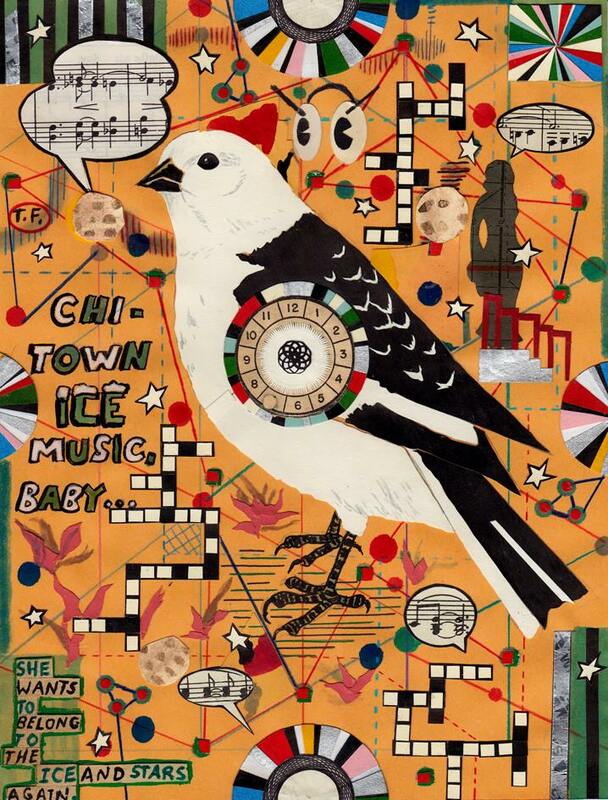 The artist plans his “sweet goodbye” to Chicago. 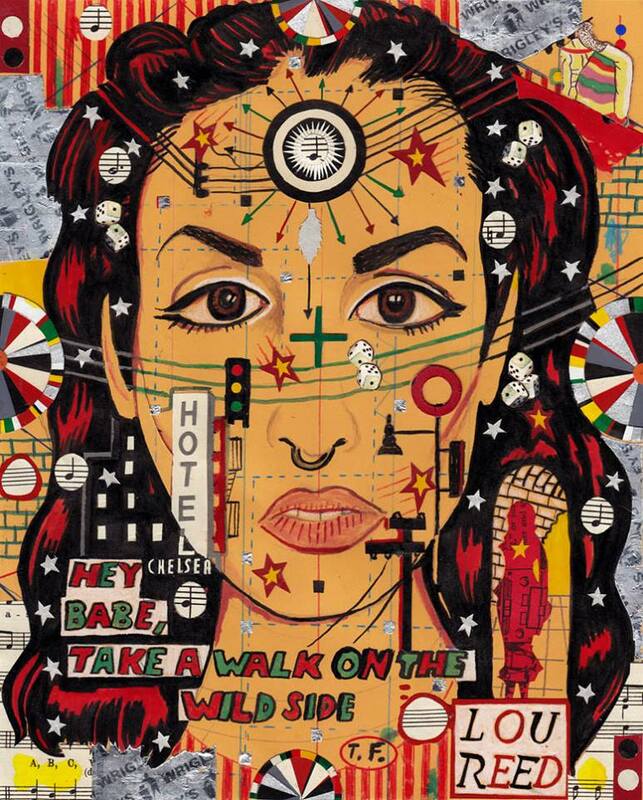 If you’ve been awe-struck and slack-jawed since Jason Foumberg broke the news of Tony Fitzpatrick’s departure in April, you may also be wondering where the artist will hold his final exhibition as a Chicago resident. Pick up your face, the wait is finally over: Fitzpatrick’s last show, The Secret Birds (knack for titles, huh?) 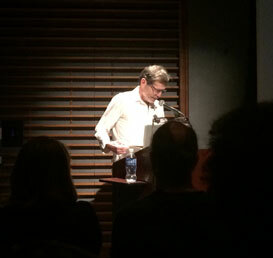 will be held at the Poetry Foundation from July 1st – September 12th. Formerly only a student of Studs Terkel and the streets, the 55 year old is leaving his lifelong home for the University of New Orleans. His interest in birds not confined to printmaking, Fitzpatrick will study ornithology and natural history in the fall. In addition to the exhibition in the Foundation’s gallery, Fitzpatrick will also produce a stage version of the show, drawn from his poetry and other writings, of the same name. The performance will feature Martha Lavey (Steppenwolf) and music by Frank Orrall (Poi-Dog Pondering). It will premiere on July 31. In case you’re not totally Tony’d out, Poetry will also run a portfolio in the July/August dedicated to Lou Reed entitled “The Day Lou Reed Set Me Free.” After that it’s time for Fitzpatrick to update his bio before he spreads his wings and flies away. Look out for info on the opening and performances related to The Secret Birds. Definitely serving high-quality snacks. The Poetry Foundation is located at 61 W Superior in River North. What you missed while you were at Kimye’s wedding. 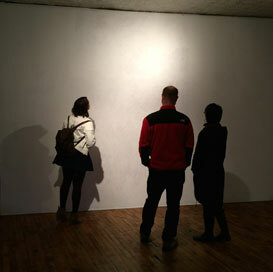 Artist, Matt Schlagbaum, convinces viewers to stare at “blank” wall at the opening for In the land of thieves and ghosts at Heaven Gallery in Wicker Park. Eileen Mueller really collapsing the distinction between art and life at the Girl Don’t Be Dumb opening at Forever and Always in Pilsen on Friday, May 16th. GDBD bathed their viewers in their signature pink in and outside of the F&A. 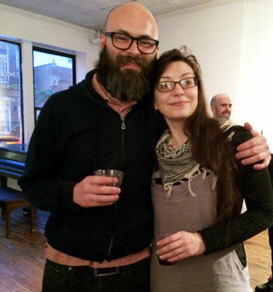 SPOTTED: Chris Hammes and Michelle Harris at In the land of thieves and ghosts. 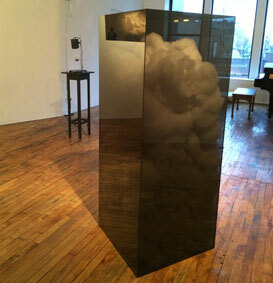 More ethereal work by Matt Schlagbaum at Heaven Gallery. A Tale of Two Anthony’s. 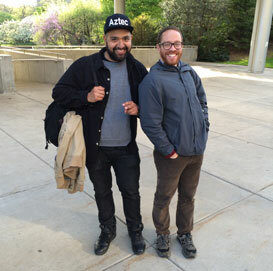 Romero and Stepter outside the The Artists’ Congress held at Northwestern May 17th. 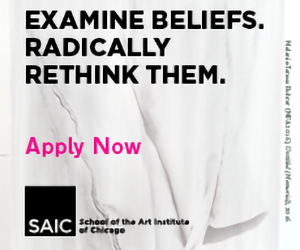 If you missed your chance to discuss radical politics in the arts, you’ll have another chance June 22nd at the follow up picnic to be held at Mana Contemporary in Pilsen. 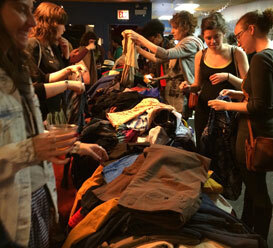 Good luck ever looking cool again if you missed the Chicago Looks Spring Swamp held at Elastic Arts Sunday May 18th. You already know we love a bargain! Featuring an unbelievable record swap, boozy punch and choice Buffalo Exchange worthy clothes all for free, the event also had local vendors like Leah Ball and Kokorokoko selling affordable duds and accessories. Shout out to the vivacious Isa Giallorenzo of Chicago Looks and the lovely Leah Ball for hooking it up!